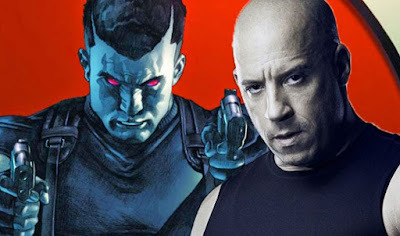 Sam Heughan (Outlander), Eiza Gonzalez (Baby Driver) and Michael Sheen (Underworld) are joining Vin Diesel in Sony Pictures upcoming sci-fi/action film Bloodshot, based on the character from the Valiant comic book universe. Dave Wilson, Deadpool and the upcoming Terminator director Tim Miller's partner at Blur Studios, will make his feature directorial debut. The screenplay is written by Oscar-nominated screenwriter Eric Heisserer (Arrival, Final Destination 5, The Thing, A Nightmare on Elm Street). "Follow in the footsteps of the recent success of Logan and Deadpool with an R-rated take on the comic adaptation." It will also be "tonally and aesthetically influenced by high-concept, sci-fi blockbusters of the last '80s including Robocop, Terminator and Total Recall." Sony is said to be very aggressive with this new franchise, with principal photography beginning in July. The film will also reunite Diesel with his Fast and the Furious producer Neal H. Moritz, who is producing alongside Toby Jaffe and Dinesh Shamdasani. Matthew Vaughn and Dan Mintz are are serving as executive producers, with Andrea Giannetti overseeing for Sony. Bloodshot is a core character in the Valiant Expanded Universe, comprised of thousands of characters covering a variety of genres and demographic groups. The character was created by Kevin Van Hook, Don Perlin, and Bob Layton in 1992. The Bloodshot series has sold more than 7.5 million copies during its run. Diesel will pay Bloodshot, a former brought back from the dead by Rising Spirit Technologies through the use of nanotechnology who has the powers of regeneration and meta-morphing made possible by the nanites injected into his body. With his mind being wiped out several times, he looks to discover who he really is and get vengeance on the people that did this to him.